Texan Tycoon Video Slot Guide & Review - Casino Answers! Texan Tycoon is a 5-reel, 25-line video slot developed by Realtime Gaming, featuring a wild substitute symbol, scatter wins, multipliers, a free spins feature and a progressive jackpot. 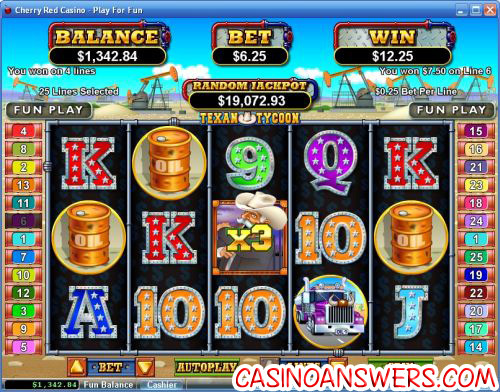 You can play the Texan Tycoon Real-Series Video Slot at USA-friendly online casinos Slots Oasis Casino and Lucky Red Casino. Bets on the Texan Tycoon slot machine are $0.01, $0.02, $0.03, $0.04, $0.05, $0.06, $0.07, $0.08, $0.09, $0.10, $0.25, $0.50, $1, $2.50 and $5 per line. You can play from 1-25 lines on a spin in Texan Tycoon. Texan Tycoon is a penny slot. As such you can bet as little as one cent on a spin or as much as $125. To manually stop the reels, hit the “Stop” button to activate the skill stop feature. To play the Texan Tycoon video slot, hit the “Spin” button. The wild substitute symbol on the Texan Tycoon online slot game is the Tycoon symbol. It only appears on the third reel and substitutes for all other symbols except for the Scattered Oil Well symbol. The Texan Tycoon symbol will multiply your winnings by 2X, 3X, 5X or as much as 10X when completing a winning combination. Texan Tycoon’s scatter symbol is the Oil Well symbol. 2, 3, 4 or 5 Oil Wells anywhere on the reels will pay out 1X, 2X, 20X or 200X your total bet. When three or more scatter symbols appear, you will get to pick one of the three to reveal up to 25 free spins. All free spins will have a 3X multiplier, thus all of your winnings will be tripled. The free spins feature can be re-triggered. Free games are played at the lines and bet of the triggering spin. Use the free spins feature to win big on Texan Tycoon by signing up at Slots Oasis Casino! The highest paying symbol on the Texan Tycoon video slot is the Cash symbol. 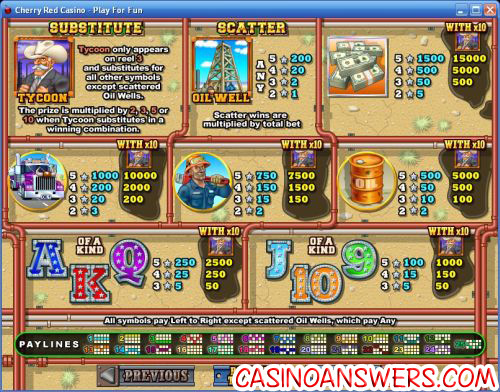 Without a multiplier, 5 Cash symbols on a selected payline will pay out a 1500 coin top payout. The Truck symbol is another high payout, worth up to 1000 coins. Texan Tycoon features a randomly triggered progressive jackpot, which at the time of this writing is at a very rich $19,308 and ready to be won. The progressive jackpot is won at random with no winning combination required to win it. Progressive Jackpot wins are added to other wins. Random Jackpot contribution is no more than 1.5% of total Return to Player. Hit the “Autoplay” button to open the autoplay settings on the Texan Tycoon slot game. You will be able to set the number of spins, set it to stop when the jackpot is won, stop if a win exceeds or equals (any amount you input), stop on any win, stop if your balance increases/decreases by any amount you input and stop once the feature is triggered. You can stop Texan Tycoon’s autoplay mode using the “Stop Auto” button. To speed up the gameplay, all you have to do is hit the “Turbo Play” button in the autoplay mode. With its potential 10X multiplier, Texan Tycoon offers some incredible fixed payouts in addition to its easy-to-win progressive jackpot. Not only that, but it has a free spins feature with a sweet 3X multiplier as well. The presentation from RTG is great, as always. The art looks fantastic and the music adds to the feel of the slot. If you’re looking for the right place to start drilling for oil, sign up and make your deposit today at Slots Oasis Casino! Are there any other oil-themed slot machines I can play? For a similarly themed classic slot from Vegas Tech, please read our Black Gold Rush Classic Slot Review or play it at the USA-friendly Go Casino. Can the Texan Tycoon video slot be played by USA players? Yes, American players can play the Texan Tycoon video slot at most RTG casinos, including two of the best, Slots Oasis Casino and Lucky Red Casino. For more on Lucky Red Casino, please read our Lucky Red Casino Review. Is there a Flash game available for the Texan Tycoon slot game? Unfortunately, RTG casinos do not offer all of their video slots on their Instant Play Flash casinos. You can play a small selection of their slots at Slots Oasis Flash Casino and Lucky Red Flash Casino.